An interesting and well-conceived new reading of the masterpieces. Den finske guitarist Timo Korhonen har arrangeret de tre sonater, som Mullova spiller i originalversionen, for sin egen guitar. Det er forbløffende, som musikken skifter karakter. Den bliver lettere og lysere, mere afslappet og afslappende, men den taber ikke sine kvaliteter. Korhonen's style of playing has a beautiful economy and utmost clarity of line. (...) The end result we hear in these performances is a luminous beauty that often has decided spiritual dimension. Selbst in den spielerisch genommenen virtuosen Finalsätzen brilliert er mit einer makellosen Tongebung - so auch im Schluss-Allegro der Sonate Nr. 2 a-Moll BWV 1003, deren von dem Gitarristen bestechend ausgeführte Echo-Wirkungen dem Satz eine besondere räumliche Tiefe verleihen. Spätestens hier wird deutlich, mit welcher Akribie (...) Timo Korhonen dem schöpferischen Prozess auf den Grund zu gehen sucht und dabei stets auf das Ganze schaut, auf die Gesamtarchitektur und Ausdruckshaltung einer kompletten Sonate. Tällä levyllä Timon kokonaisvaltainen lähestymistapa saa apoteoosinsa. 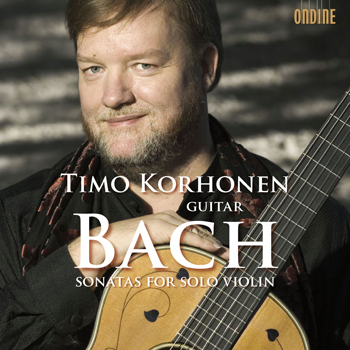 This recording features Finnish guitarist Timo Korhonen with his own published transcriptions of famous violin works: Johann Sebastian Bach's three Sonatas for Solo Violin. Timo Korhonen's arrangements for modern guitar remain very faithful to the original compositions, and the historically informed performance reveals Korhonen's profound understanding of their style. In the booklet notes, Timo Korhonen reveals his theory about the meaning of the works. Timo Korhonen is a real insiders' tip with a loyal fan base at major festivals and concert venues around the globe. His imaginative and innovative performances of contemporary and less known works continue to create much excitement. Concerto appearances feature him along with conductors such as Esa-Pekka Salonen, Jukka-Pekka Saraste and Sakari Oramo. His acclaimed recordings for Ondine include Leo Brouwer's 'Helsinki Concerto,' dedicated to him by the composer, which won a Cannes Classical Award in 2003 (ODE 979-2).